Corus Corax are a Swedish company producing 35mm resin miniatures. These look interesting and a bit different. The project is just over 25% funded – the company are looking for 75,000 KR. The project is running until the 9th October, with anticipated delivery of January 2017. Euro War Games are creating a new skirmish level wargame based in the near future, where the world has separated into factions in a new global war. The project is to create the rules plus a number of 32mm miniatures and vehicles for the game. The project is 30% funded against a funding goal of 13.250 EUR, and is due to finish on the 25th October. Delivery is due in February 2017. 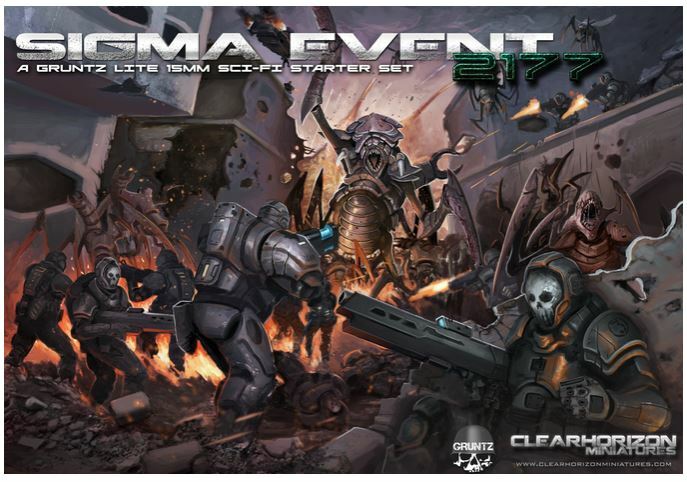 We like Gruntz, the 15mm Sci-Fi game written by Robin Fitton, here at Meeples & Miniatures. Clear Horizon Miniatures is running a Kickstarter campaign to fund a Gruntz-lite game ( a simplified version of the Gruntz rules), complete with two starter armies. The project has reached 55% of it’s $8,000 funding goal. The project is running until the 24th October with delivery scheduled for March 2017. Mantic Games latest offering – Star Saga is a sci-fi version of their Dungeon Saga game set in the Warpath universe. This is a new boardgame complete with 28mm miniatures. It’s reached almost 200% of its $100,000 funding goal, and is due to finish on the 21st October, with delivery due in October 2017. Crawling Chaos Games are creating this game. They have reach 50% of their 55,000 EUR funding goal. The project is running until the 26th October, with delivery scheduled for September 2017. The Miniature Building Authority are running a project to create a28mm scale pre-painted castle and medieval buildings scenery. This is the second of these, which is creating expansion pieces for their first castle set. This project has reached 133% of it’s funding goal, and is due to finish on 17th October, with delivery in July 2017. Clear Horizon Miniatures is a quality company run by a great guy.